The Thurgood Marshall U.S. Courthouse, originally known as the U.S. Courthouse at Foley Square, is a prominent feature of New York City’s Civic Center, north of City Hall Park. For much of the nineteenth century, what is now known as Foley Square was part of a working-class immigrant district called Five Points. The area deteriorated into a notorious slum that was displaced by a group of government buildings in the early twentieth century. Foley Square was named in 1926 in conjunction with the construction of the New York County Courthouse. The courthouse was one of Gilbert’s last great works. In its design, Gilbert adapted classical design elements to a steel-framed skyscraper to provide a building with 300,000 square feet of usable space on a 47,000 square foot site. 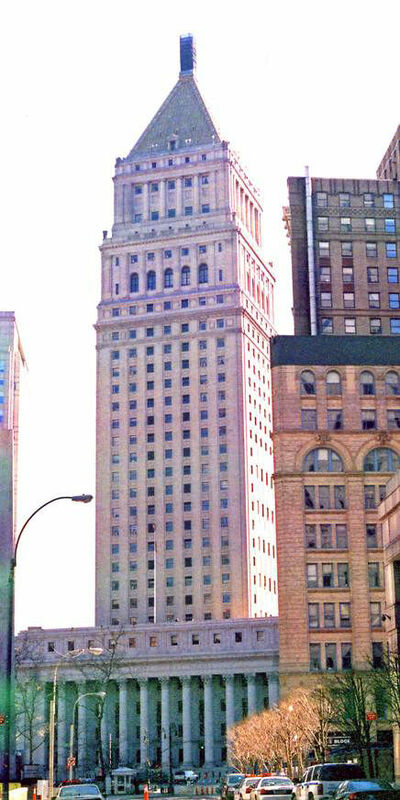 The design also complemented the New York County Courthouse (1919-1927) and the nearby twenty-three story Municipal Building (1912-1914). Construction of the federal courthouse began in July 1932 and was finished three and a half years later, under the direction of Gilbert’s son, Cass Gilbert, Jr.
A major modernization of the building was completed in 1992. The project also involved the restoration of three of its sixteen historic courtrooms. In 2001, the courthouse was renamed in honor of Thurgood Marshall (1908-1993), Chief Counsel of the NAACP and the first African American appointed to the U.S. Supreme Court. Marshall served as a Supreme Court Justice from 1967 to 1991. The building was closed in 2007 for another major renovation and restoration campaign, due to be completed in 2009. The thirty-one story, 590-foot Thurgood Marshall U.S. Courthouse is prominently located in Manhattan’s Civic Center district, just a few blocks north of the Brooklyn Bridge and City Hall Park. The six-story base, faced with rusticated Minnesota granite, wraps around three interior courtyards and has an irregular shape that follows the outline of the site. 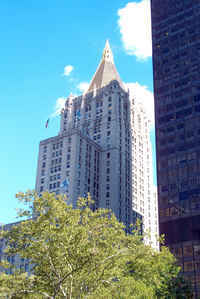 The square tower, also faced in Minnesota granite, is set back a considerable distance on the base, but parallel to the front of the building. This configuration creates a prominent presence for the building in the city skyline, while relating to the size and scale of nearby buildings at street level. Urns at the tower’s corners mark a setback at the twenty-seventh floor. A three-story Ionic colonnade around the tower rises to the steeply pitched, pyramidal roof. The roof is of terra cotta, covered in gold leaf, and is topped by a small open lantern, also of gold-leaf-covered terra cotta. The roof design recalls those on Gilbert’s nearby Woolworth Building and New York Life Insurance Company Building. Notes presented here for the U.S. Federal Courthouse are from a brochure developed for the GSA by Marjorie Pearson.